As Antipholus of Syracuse remarks in Shakespeare’s The Comedy of Errors, the town of Ephesus “is full of cozenage / As nimble jugglers that deceive the eye, / Dark-working sorcerers that change the mind [and] Disguised cheaters.” For costume designer Beaver Bauer, Cal Shakes’ production of The Comedy of Errors is a welcomed challenge. The magic present in Errors differs greatly from other examples of Shakespearean sorcery because the illusions seen on stage are rooted in farce, not enchantment. Thus, the costume design plays a pivotal role in the audience’s involvement and comprehension of the baffling events that transpire on stage. Beaver Bauer's costume design on display during The Comedy of Errors rehearsal. Pictured: Nemuna Ceesay (Adriana) and Tristan Cunningham (Luciana). Photo by Jay Yamada. For the women of The Comedy of Errors, especially the sisters Adriana and Luciana, Bauer cites the upper and royal classes of Asia Minor in the 1920’s. Bauer notes that, during this time period, the men were wearing traditional vestments, but the women were more likely to wear western-styled gowns (i.e. “flapper dresses.”) Bauer incorporates this aspect into her design because, although The Comedy of Errors is “not rooted to a specific time period” it is, very clearly, “rooted in a specific place.” This mix of Eastern and Western fashion perfectly encapsulates Posner’s vision of not interpreting the play through a specific historical lens. Another major factor that went into Bauer’s costume design was the notion of currency and economic status, which proves a major theme in The Comedy of Errors. The frequent transfer of money and goods throughout the play allowed Bauer and her team to think creatively about how each character would carry valuable goods and funds, such as in an Eastern money pouch or in a Westernized cummerbund. These small yet significant costume pieces also grant Bauer the opportunity to add dynamic colors and patterns to the existing pallet. Beaver Bauer's costume design on display, pictured on actor Liam Vincent (Duke, Balthasar) during rehearsal for The Comedy of Errors. Photo by Jay Yamada. You can see Beaver Bauer’s costumes in The Comedy of Errors, which is playing at the Bruns till July 20th. Get your tickets here! Philippa Kelly, Resident Dramaturg for Cal Shakes, invites your questions about The Comedy of Errors, which runs June 25–July 20. Tickets on sale now. The Comedy of Errors, one of Shakespeare’s earliest plays, is a beautiful, festive comic treat about losing yourself and then finding yourself again. The play is Shakespeare’s shortest, first staged at the Inns of Court as part of an evening’s entertainment. Two sets of identical twins, both lost—one pair (twin plus master) settled prosperously in the city of Ephesus, the other pair alighting on Epheus after seven years of wandering. Add to this a wife, a suitor, and a long-lost set of parents—and here, in all its perverse comic confusions, we have a comedy: one that would set a template for Shakespeare’s future capacity to enchant, entertain, and philosophically provoke. Are you going to see our production of The Comedy of Errors? Do you have questions or comments about the production’s cast, themes, creative choices, or anything else? Please leave them in the comments, and I’ll be sure to respond. Resident Dramaturg Philippa Kelly muses on twins in Shakespeare’s work and time. Frontispiece from "Tales from Shakespeare," McLoughlin Brothers, 1890. Public domain. This season Cal Shakes will stage Shakespeare’s two plays—The Comedy of Errors and Twelfth Night—the plots of which are facilitated by identical twins. In Twelfth Night, directed for us and Intersection for the Arts by Michelle Hensley (Artistic Director and founder of Minneapolis company Ten Thousand Things), there is one set of twins, a boy and a girl, who constitute Shakespeare’s famous medical “mistake.” You can’t have identical twins of different genders—we know that now—but in Shakespeare’s day this wasn’t known. There was, however, a great public interest in twins, due in no small part to the fact that twins were supposed to be engendered by an excessive female response to sperm, and also to the fact that twins were so difficult to give birth to, let alone to raise to maturity. Today twins are very common, partly because of in vitro fertilization and partly because the infant mortality rate has greatly shrunk in the western world. But in Shakespeare’s time this was not the case. Many parents did not name their children until the age of five, so great was the chance that the child would die during its early years. Shakespeare himself was not the oldest of his siblings, but was the first to live past infancy. Imagine how even higher the stakes were for parents of twins. With twins’ added risk of a great range of nutritional and obstetric problems, as well as low birth weights and increased prematurity, they were widely thought to punish their mothers by adding to the pain borne by every pregnant woman (such pain being referred to in The Comedy of Errors as “The pleasing punishment that women bear”). Shakespeare and his wife had twins, only one of whom survived past childhood. 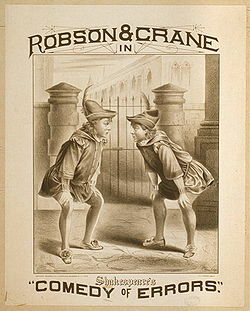 Poster for an 1879 production on Broadway, featuring Stuart Robson and William Crane. Twins provide a great plot engine for Shakespeare—they allow him to create complications, mockeries and new inventions. Thematically, moreover, twinning gives him an opportunity to explore the mind-body connection which is still so puzzling today, and which can be reflected in Shakespeare’s own puzzlements about the relation of the mind to the body (“Your face, my Thane, is a book/Where men may read strange matters”; “There’s no art/To find the mind’s construction in the face…”Macbeth). Conversely, twins also allowed him to explore his fascination with the “twinned” juvenile soul of friendship that is, as children mature, gateway to minds and bodies that become fatally divided in adulthood (“Two cherries on one stem,” A Midsummer Night’s Dream; “twinned lambs/That did frisk in the sun,” A Winter’s Tale). But in this season’s two plays about physical twinning, division returns to harmony. In each case, the brutal “splitting” of the ships that have carried identical twins away from each other resolves in the jubilation of togetherness, the celebration and relief that is reclaimed in a single root.